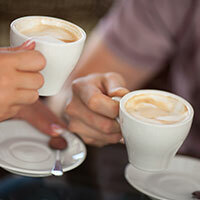 According to new research from Boston’s Brigham and Women’s Hospital, drinking coffee may help prevent tinnitus. A bothersome ringing, buzzing, or whooshing in one’s ears, tinnitus is currently experienced by approximately 50 million Americans. Over the course of 18 years, the study tracked 65,000 women and discovered that those who drank up to five cups of coffee every day ultimately reduced their susceptibility to the condition by 15%. In total, 5,289 cases of tinnitus were reported in the study. There is currently no cure for tinnitus, and it can be caused by multiple sources—from overexposure to loud sounds to illnesses. It is typically associated with some type of hearing loss. Reach the published study in the American Journal of Medicine. Learn more about today’s advanced tinnitus solutions that can bring relief.